A JURY HAS found former Anglo Irish Bank boss David Drumm guilty on charges of conspiracy to defraud the public and of false accounting in 2008. Shortly after 3pm on day 86 of the trial, a jury at Dublin Circuit Criminal Court returned the unanimous verdicts of guilty on the two charges. The jury had been deliberating for just over 10 and a half hours. Judge O’Connor thanked the nine men and three women of the jury, telling them they had performed an enormous public service. Drumm (51), who was on bail throughout the trial, sat impassively as the registrar took the verdicts from the jury forewoman and Judge O’Connor made her remarks. It was the State’s case that Drumm had conspired with Irish Life & Permanent’s former CEO Denis Casey, Anglo’s former financial director Willie McAteer and Anglo’s former head of treasury John Bowe, among others, to carry out €7.2 billion in fraudulent circular transactions in order to bolster the customer deposits figure on Anglo’s balance sheet. The State also alleged that this €7.2 billion was falsely accounted for as part of the bank’s customer deposits in preliminary accounts published on 3 December 2008, therefore misleading the market as to Anglo’s true strength. Bowe (54), McAteer (67) and Casey (58) were convicted on the conspiracy to defraud charges in June 2016 and subsequently jailed. Detective Sergeant Michael McKenna told the court he was objecting to a continuation of bail and said that Drumm would be aware that his co-conspirators received substantial prison terms for their role in the conspiracy. Drumm, formerly of Wellesley, Massachusetts in the US, was subject to lengthy extradition proceedings and was held in custody for five months in a US Federal Penitentiary. He made a number of unsuccessful applications for bail during this time and ultimately consented to his extradition in March 2016. McKenna said he firmly believed that Drumm posed a flight risk. Brendan Grehan SC, defending, asked the court to grant bail on humanitarian grounds. He said that his client’s wife and children were back in the US for a graduation ceremony and he asked that sentencing be delayed until they were able to get back into the country. He said that Drumm had abided by the strict conditions of his bail throughout the trial. Judge Karen O’Connor noted that there were no breaches of the bail conditions. She released Drumm on bail on condition that he sign on daily at Balbriggan Garda Station. The maximum sentence for the conspiracy to defraud charge is unlimited. The maximum sentence for the false accounting charge is 10 years. During the 16-week trial, the State called 49 witnesses to give evidence regarding the transactions whereby Anglo lent money to Irish Life & Permanent and ILP sent the money back, via their assurance firm Irish life Assurance, to Anglo. The scheme, described by the prosecution as “a massive con”, was accounted for so that deposits came from the assurance company and were treated as customer deposits, which are a better measure of a bank’s strength than interbank loans. The prosecution argued that the objective of the conspiracy, in which the money moved “at lightning speed”, was to mislead anybody reading Anglo’s accounts by artificially inflating the customer deposits number from €44 billion to €51 billion. An expert witness for the State, Dan Taylor of BDO accountants, testified that there was “no commercial substance” to the transactions, and described them as misleading and inaccurate. Lawyers for Drumm made a series of admissions on his behalf on the opening day of his trial, accepting the transactions as alleged took place, but disputing that they were fraudulent or dishonest. The prosecution said these “so-called admissions” were self-serving and not based on the facts of the case. The defence called no witnesses during the trial. Counsel for Drumm said he never set out to commit any kind of fraud, and “togged out for Ireland” when the Central Bank came to him during the international financial crisis and asked Irish banks to help each other out. Drumm’s barristers said he did his best in good faith and in the unrivalled circumstances which arose during the recession. But the State said it was no defence that the financial market was under pressure and that Anglo was going down the tubes anyway at the time of the transactions. “This does not exonerate those who acted to try to keep the bank limping on for another few days,” Mary Rose Gearty SC, prosecuting, told the jury. She told the jurors that a recorded phone call played in court between Drumm and his co-conspirators during which they discussed the “money going around in a circle” was clear, reliable and contemporaneous evidence that the men were discussing a criminal conspiracy. Counsel for the State said it was such a monumentally fraudulent scheme that it was hard to understand why it had not been called out by people in the bank. The prosecution argued that there was no evidence that the Central Bank or the Financial Regulator knew of the transactions before they happened and said, even if they did, this was totally irrelevant to this trial. Drumm, of Skerries, Co Dublin, had pleaded not guilty. Email “Former Anglo CEO David Drumm has been found guilty ”. 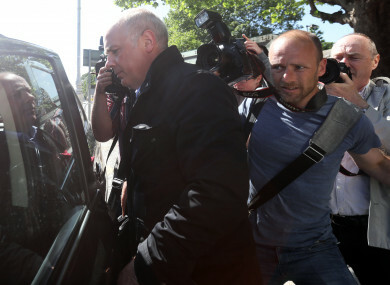 Feedback on “Former Anglo CEO David Drumm has been found guilty ”.